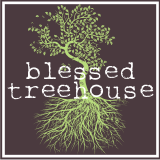 Blessed Treehouse: Sledding: the only thing I'll miss about winter. Sledding: the only thing I'll miss about winter. And even that is a stretch. Especially considering my fanny never touched a sled this winter. Or last winter. Or the one before that. Look, I used to enjoy winter in Ohio. As a kid, it was pretty awesome. When I grew up, they'd call a snow day over a few funny lookin' flurries, and make-up days were a joke. It made skipping school a lot easier when school was already canceled. But now that I'm a stay-at-home-mom, I despise winter in Ohio. Sure, it can be beautiful (for one week in early January before the state is covered in poop-colored sludge). But a week after the new year, right about when the holiday hangover sets in, it gets brutal. B-R-U-T-A-L. Imagine being under house arrest (minus the awesome ankle bracelet) while your 2 year old stuffs matchbox cars into your boots (causing a painful surprise when it's time to shovel and you fumble into your boots for the fifteenth time that day) and your 18 month old eats salt from the floor of your foyer. And that last for 3 months. And though we made the most of this winter (God bless COSI and the library), I have never ever been more ready for Spring. But this post was supposed to be about sledding. 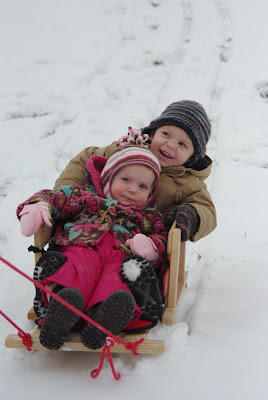 And though I wasn't even there to watch my minis sled happily down the hill at Grandma & Grandpa's house, these pictures help me to realize that I might miss winter after all. Actually, that's not true. I'm pretty sure winter can kiss it and never come back. Sorry, kids. And in case you are thinking, "but Christmas is great, and that happens in winter." You're wrong. At best, Christmas is late Fall around here. And I'm not in the mood to see the bright side. So don't start with me. *My in-laws are saint-like human beings who enjoy wearing a ridiculous number of layers so that they can spend 10 picture-perfect minutes outside in the stupid cold in an effort to create happy memories with my children. They will surely receive a multitude of blessings when they meet the good Lord. As will my husband. 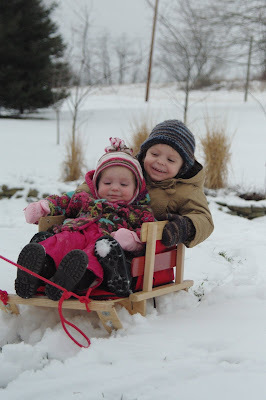 He obliged to my request to "take lots of pictures - I don't want to miss out on their first sled of the season." He's a good man who enables my grinch-like behavior. Mo - amen to that. Becky and Roger make my kids' dreams come true when I'm too big of a brat to do it myself. Which is often. I'm a huge Roger Hooper fan. And Becky Hooper. And Matt Hooper. All the Hoopers actually, even the ones who married in. becky hooper + harper hooper + sled = the cutest thing in the world. I love that pic!!! If my own kid didn't love the snow so much I would move to south carolina. I've been meaning to ask because you always have great pictures on here... what kind of camera do you use? There is a dark side.